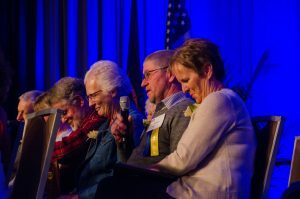 During the MMPA annual meeting on March 23, 35- and 50-year members shared stories and words of advice about their membership with the cooperative through the years. LANSING, Mich.—Twenty-three MMPA members were recognized with 35 or 50 year member awards at the MMPA 101st Annual State Delegate Meeting, March 23, 2017. MMPA has traditionally recognized 35-year members and last year added the new MMPA Milestone award to honor those holding membership for 50 years. After the 35-year members were recognized, Nobis recognized the group of MMPA Milestone award winners who joined MMPA in the year 1967. The presentation highlighted information from 1982 and 1967, when these members joined MMPA. In 1982, there were 6,046 MMPA members in who marketed a total of 3.4 billion pounds of milk, while in 1967 membership totaled 7,973 and marketed 2.6 billion pounds of milk. Today, MMPA has approximately 1,200 members and marketed over 4.8 billion pounds of milk in the 2016 fiscal year.